I have clients that make getting out of bed worth the effort, after I have fallen asleep at 2:30 a.m. working on their project. These are clients that show up early to my office, eager to see the freshest designs for their vacation house or new church. They find joy in my creative process. 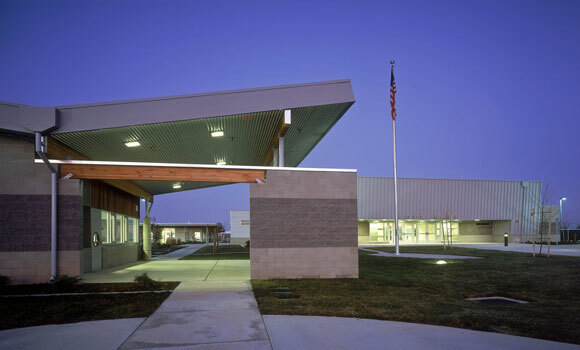 With my Pasadena studio named A4E, I served Superintendent Jeff Holland, designing an innovative campus in Yuba City, California. Named Feather River Academy, this “alternative education program” teaches students who have failed in traditional academic venues. 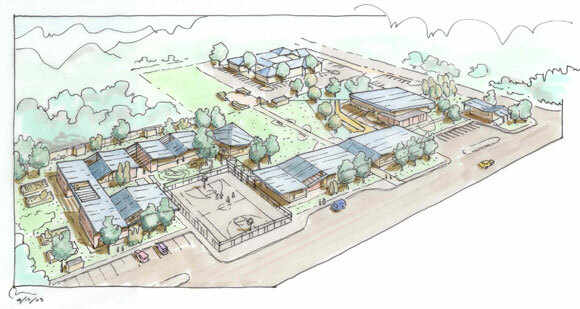 My business partner Gaylaird and I proposed a straightforward but innovative approach: let the students design their school. Jeff supported this off beat approach, which landed me in a kick-off “client” meeting with disaffected youth, some accompanied by their parole officers, some single mothers at 15. If one were to assume that this group of lost teenagers would not be engaged in a stuffy architectural process, one would assume incorrectly. At this first meeting, I showed up with a tabletop-size physical model of the site. I also arrived with what eventually became a signature of mine over the years, the Kit-of-Parts. Kit-of-Parts. For each programmatic element of this new school, I brought colored blocks of foamcore: classrooms, gym, cafeteria, offices, art room, etc. Green and tan cardboard represented the outdoor areas: basketball court, social spaces and parking. I made all my pieces to scale. The clients/students literally had the building blocks of their future school. I quickly learned from the students: no to big buildings, yes to a village of smaller buildings, nothing institutional or prison-like. 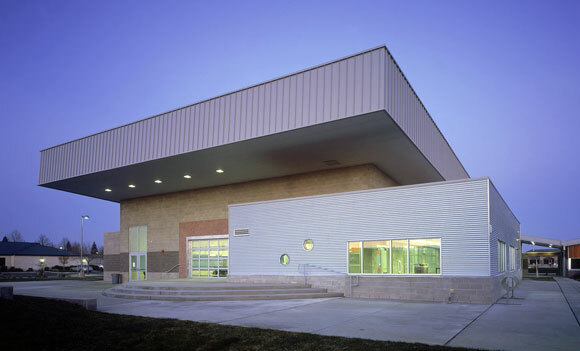 They wanted classrooms directly adjacent to the basketball court, sought an open campus feel of one-story structures, and so on. The design results of these sessions became the basis of the entire campus plan. 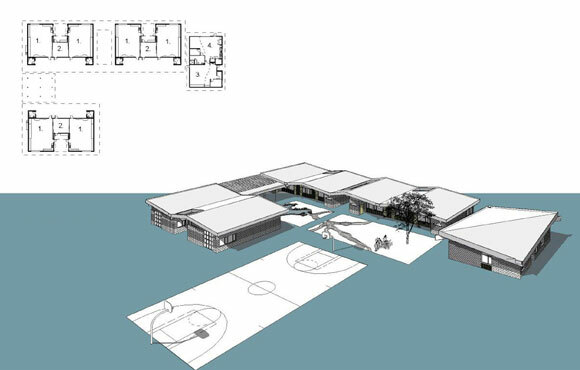 Furthering the participatory process, our studio hosted one of these students as an architectural intern, so as to be part of developing his own school, while learning at a professional design company. At the time to present to the Board of Education in a large televised public hearing, this same student, once labeled “at-risk,” was our primary presenter. The Board received his presentation and personal statements with applause. 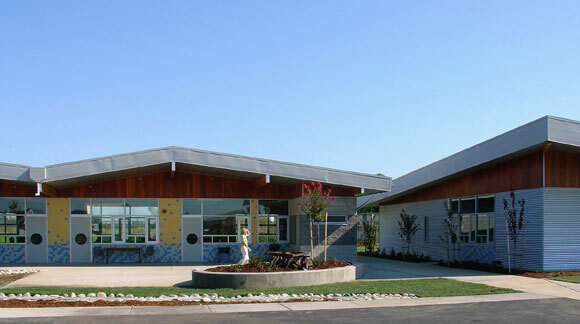 Feather River Academy opened its doors in 2005, and shortly after, was honored with a dozen national design awards. Guilty of profiling, I have categorized my best clients. Those of us in the service industry relying on customers, we all know these people. There is no end to clients that are professional, altruistic, generous, sympathetic, cheerful, unwavering, heroic, and inventive. Some are veritable humanitarians, and some are even spiritual deities. Literally. See: To Accommodate and To Defer. Though there are bad clients, the ones that send me home shrieking with frustration, the ones where money is lost, and the ones that literally frighten me—it is the good clients that get me up every morning.